Over the last century the community has changed dramatically. No longer are there acres of forest, with the exception of Dash Point State Park bordering the northeast side. Today there are acres of homes networked by streets, with a golf course, a community center, schools, and a few "mom & pop" type businesses. Browns Point and Dash Point are situated on an elbow of land which is surrounded on three sides by the Puget Sound. To the north nearly three miles across the water, are Mauray & Vashon Islands. Over to the west about four miles is Point Defiance, a peninsula of land which divides the Tacoma Narrows from Commencement Bay. To the south, Commencement Bay and the tide flats of the Puyallup River; home of the Port of Tacoma. 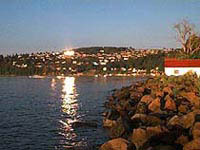 The City of Tacoma can be seen on the facing hillside of the farthest south side of Commencement Bay. The two points rise from the water's edge at varying grades toward a common high point called Harbor Ridge; a recently new housing development. Viewed from the water, these hillsides are dotted with houses, many of which enjoy breath-taking views of the area's natural beauty. Geologically, the Browns Pt. / Dash Pt. area is particularly interesting. The hills are made up of layers of gravel, sand, and boulders with alternating layers of clay. With enough water acting as a lubricant between them, the earth of these hills can shift. The Thames Creek, which divides the Dash Pt. residential area from Dash Point State Park to the east, seems to mark a fault in the earth's surface. On the east side of the creek one can drill down over 1,800 ft. and not find water, but on the west side one can dig a mere 30 - 60 ft. and find artesian water.